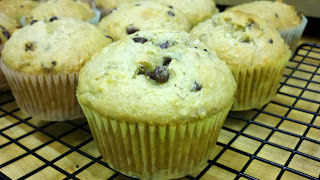 I was going to make banana bread tonight, but I thought I'd make banana bread muffins instead. I decided to mix things up a bit and add mini chocolate chips and coconut. I also added chopped almonds, since I was out of walnuts. Mash bananas mix in oil, sugar, egg, and vanilla. Then add flour, baking soda, baking powder, and salt. Add Coconut and Chocolate chips. Divide equally into loaf pans. Makes 1 large loaf. Bake 350° for 1 hour. If you want to do the muffins, Bake at 350° for 15-20 min.